After the Citizens United decision, millionaires and billionaires were free to spend as much money as they wanted to on political campaigns. If someone like Sheldon Adelson decided to spend $100 million helping Republican candidates, that was up to him. Now imagine if that donation were tax deductible. The new tax bill might just allow for that, including donations of "dark money," which cannot be traced to the donor. The issue began with the repeal of the Johnson amendment, which forbids churches and other nonprofits from supporting or opposing candidates for office. But negotiators from the House and Senate are considering changing the language to allow political donations, even secret ones, to be tax deductible. Gloria Allred held a press conference yesterday with her client Beverly Young Nelson, who has accused Alabama Senate candidate Roy Moore of sexual assault. Young admitted that the note below Moore's inscription in her high school yearbook giving the date and place of their meeting was something she added later. Many people had already noted that the handwriting of the inscription itself, which reads: "To a sweeter more beautiful girl I could not say Merry Christmas. Christmas 1977. Love, Roy Moore, D.A." is different from that of the date and location below it. However, Allred also said that she had a handwriting expert, Arthur T. Anthony, confirm the signature as being Moore's. He could determine this by comparing it to Moore's signature on the many public documents available on which it is present. 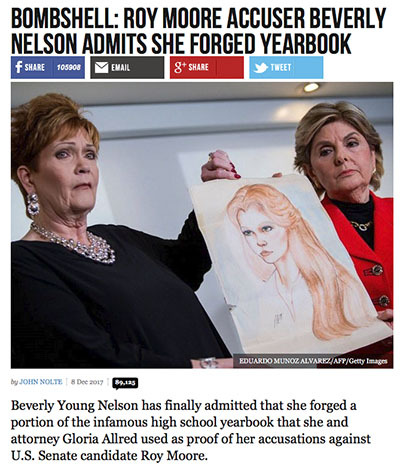 Breitbart goes on to excoriate Nelson and Moore's other accusers in no uncertain terms. With that said, Fox News has already been compelled to back off their use of the word 'forgery,' as that is not an accurate description of what happened here. Donald Trump traveled to Pensacola, Fla.—just 25 miles from the Alabama border—yesterday to hold one of his signature campaign rallies. When the event was originally planned, it was set up to be a pro-Roy Moore rally without being too obviously a pro-Roy Moore rally. Since then, Trump has gone all-in on Moore, so there was no need for pretenses Friday. The President spent most of the night talking about how great a guy Moore is, and how the yearbook (see above) is fake news, and how electing a Democrat like Doug Jones to the Senate would only be slightly less bad than electing Satan himself. It has been long expected that there will be a major exodus from the White House as Donald Trump approaches the one-year mark. The announcements are already starting. Deputy National Security Adviser Dina Powell has said that she is departing early next year. Powell has been an all-purpose adviser on foreign policy. She has also planned all five of Trump's foreign trips, as well as his visit to the U.N. General Assembly in September. Powell is a Coptic Christian who was born in Egypt and speaks fluent Arabic. The Democratic Congressional Campaign Committee (DCCC) is very much liking its chances, and senses that a big, big wave is coming. Under normal circumstances, perhaps 25 or 30 GOP-held House districts would qualify as competitive. The DCCC, however, drew up a tentative list of 80 Republican districts they plan to target in 2018. On Friday, they added 11 more to the tally: OH-12, PA-11, PA-15, and TX-21 (all open seats); UT-04 (Mia Love); NY-02 (Pete King); IN-09 (Trey Hollingsworth); CA-04 (Tom McClintock); WA-05 (Cathy McMorris Rodgers); WI-06 (Glenn Grothman); and WI-01 (Speaker Paul Ryan). The complete list of 91 races, covering 30 states, can be seen here. It's quite an ambitious list, but it's not completely unreasonable. The whole point of gerrymandering, as the Daily Kos points out, is to create as many districts with small but solid majorities as is possible. Optimally, that means something like 53% voters from your party, and 47% voters from the other party. In a wave year, that can become the basis for a massive collapse. Certainly, some of the Republicans being targeted are nervous. "I am very apprehensive about the future," said Grothman, while McClintock acknowledged the existence of "a huge enthusiasm gap that favors the Democrats right now." Michigan state law requires that when a House seat becomes vacant, then the governor must call a special election to fill it. But in contrast to most states, where the law gives the governor a narrow window when the election must be held (typically 60 to 90 days from the time the vacancy occurs), Michigan law is silent on when the special election will be held. So Gov. Rick Snyder (R-MI) was perfectly within his rights to declare that the special election to fill the seat of John Conyers, who resigned from the House this week, will be held on Nov. 6, 2018. This means that most of the people in Detroit won't have a representative for nearly 11 months. Snyder said that the late date gives potential candidates plenty of time to prepare for it. The truth, of course, is completely different. In other states candidates can prepare in 60 days, so why not in Michigan? Snyder knows that Conyer's district has a PVI of D+33 and is dominated by black Democrats. The winner of the election will virtually certainly be a black Democrat, especially given that this seat has not been open for over 50 years and their are plenty of state representatives and state senators who would like to move up the food chain. By keeping the seat open for 11 months, his decision deprives the Democrats of a vote in the House, and that could prove important with a number of crucial votes scheduled for the coming weeks and months. An additional factor is the confusion this date sows. On Nov. 6, 2018, there will be a special election to fill out the remaining 2 months of Conyers' term. Since the House is not likely to be in session then, winning the seat is meaningless, although it might be nice to add "former member of the U.S. House of Representatives" to your C.V. However, there will also be a regular election for the term beginning Jan. 2019. Undoubtedly many voters will not understand why there are two elections for the same seat at the same time and will make mistakes on their ballots. Still, the district is so Democratic that even if half the voters spoil their ballots, the Democrat will almost certainly win both races. The Democratic Party is considering a major revision to its process of choosing a presidential nominee. In addition to the delegates selected in primaries and caucuses, hundreds of party leaders were also voting delegates in 2016, and by a large margin they favored Hillary Clinton over Sen. Bernie Sanders (I-VT). Many Sanders supporters still believe that it was these "superdelegates" who swung the nomination to Clinton. Actually, she got it because she got 3 million more votes from Democratic voters than he did, but many Sanders supporters are angry anyway. Is there any level of pettiness to which Donald Trump will not stoop? It's one of the great unresolved questions of the universe, like "Who was Jack the Ripper?" or "What was the purpose of Stonehenge?" On Friday, the Washington Post reported that when he tapped Ronna Romney McDaniel to be RNC chair, Trump asked that she stop using her middle name in official communications. Dec04 Clinton for U.S. Senate?